The Coca-Cola-owned brand is teaming up with Merlin Entertainments for its 'Twisted Carnival' experiential activities. Visitors to the attraction will be invited to explore five interactive rooms featuring Halloween frights, as part of an immersive, spooky-themed experience. The event was promoted with a publicity stunt on 4 October devised by Taylor Herring. A ghoulish old lady sitting in a rocking chair roamed several stations on the tube. 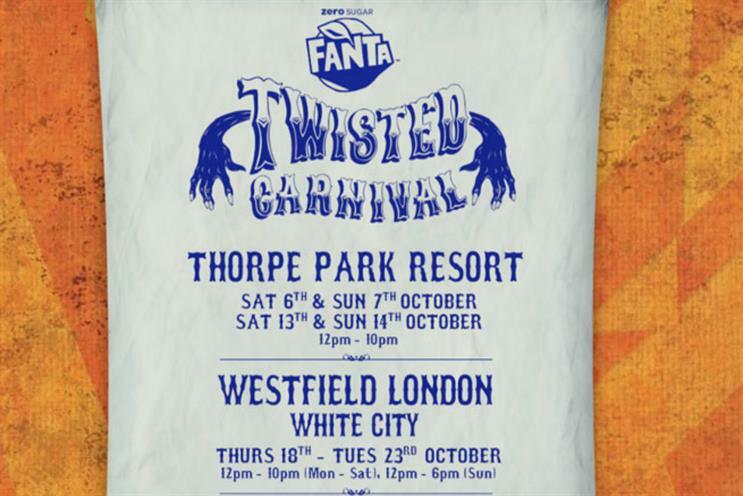 Fanta's Twisted Carnival is taking place at Thorpe Park over the next two weekends (6th-7th and 13th-14th October), at Westfield London White City from 18th-23rd October, at the Bullring and Grand Central Birmingham from 27th-31st October and at Liverpool One on the 3rd-4th November.